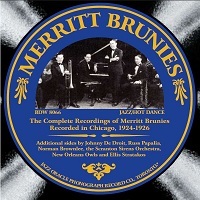 The complete recordings of Merritt Brunies and His Friars Inn Orchestra, led by the New Orleans trumpeter and his brother, trombonist Henry Brunies. The compilation also includes several other rare New Orleans tracks by Johnny De Droit, Papalia & His Orchestra, Brownlee’s Orchestra of New Orleans, Scranton Sirens Orchestra, New Orleans Owls and Ellis Stratakos & His Jung Hotel Orchestra. The extensive liner notes are by noted researcher Ate van Delden. Merritt Brunies (c), Henry Brunies (tb), Volly de Faut (cl, as), Clarence Piper (as, bjo), Sumner “Rip” Logan (ts), Dudley Mecum (p), Norman Van Hook (bb), Bill Paley (d). Bill Creger (as, cl) added. From now on, Piper plays banjo only. Lew King (v). Maurice Friedman (p) replaces Mecum. Gordon Pouliot (vln) added where noted. Creger may play bassoon where noted. Logan plays C-Melody saxophone where noted. Johnny De Droit (c) directing Ellis Stratakos (tb), Henry Raymond (cl), Rudolph Levy (as), Frank Froeba (p), George Potter (bjo), Paul De Droit (d). Russ Papalia (tb) directing possibly: Henry Knecht (c), unknown (cl, as), Eddie Powers (ts), Vic Lubowski (p), Mike Holloway (bjo), George Triay (d). Sharkey Bonano (c), Tom Brown (tb), Harry Shields (cl, bar), Hal Jordy (as), Howard Martin (ts), Norman Brownlee (p), Behrman French (bjo), Alonzo Crumby (d). Billy Lustig (vln) directing 2 unknown (t), Russ Morgan (tb), Alfie Evans-Sid Trucker (cl, as), Jim Crossan (ts), Itzy Riskin (p), unknown (bjo), Mike Trafficante (bb), Teg Noyes or Ray Bauduc (d). Benjamin “Benjy” White (cl, as) directing Bill Padron (c), Lester Smith (ts), Edward “Mose” Farrar (p), Rene Gelpi (bjo), Dan LeBlanc (bb), Earl Crumb (d). Ellis Stratakos and His Jung Hotel Orch. John Hyman (Wiggs)-Howard Reed (c), Ellis Stratakos (tb), John Reininger-Joe Loyacano (as), Eddie Powers (ts), unknown (vln), Joe Wolfe (p), Fred Loyacano (g, v), Dave Fridge (bb), Von Gammon (d). One of the reedmen plays baritone saxophone where noted.